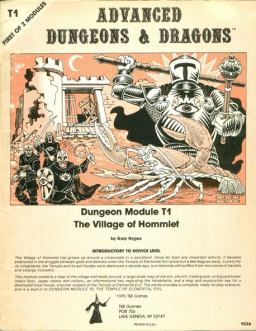 A while ago, my 13-year-old daughter Taylor told me her friend Will had seen the famous “Advanced Dungeons and Dragons” episode of Community and wanted to learn how to play. “Sure,” I said. “Tell him to come over on Saturday and I’ll put together a quick adventure for both of you.” My 15-year-old son Drew joined in, creating a fighter, and even Tim, my 17-year old, got in on the action, rolling up a 1st level magic user. That was over six months ago. What began as a simple session, involving a bunch of farm kids rescuing a dwarven thief named Jasper from marauding gobins, has evolved into an epic campaign, a desperate adventure to stop an army of hobgobins and orcs from completing a railroad that will bring war to their frontier home. It’s the most fun I’ve had role playing in decades. I introduced my kids to D&D years ago, but we played only intermittently, and the campaign — such as it was — never really built up steam. The addition of a fourth player, from outside the family, has brought with it a regular Saturday morning schedule, and the result is a much heightened level of interest from everyone involved. Things are happening faster, they’re leveling up quicker, and they spend the days between sessions talking excitedly, planning, and trying to puzzle out how all the clues they’ve uncovered fit together to reveal the sinister plan behind events. It’s brought a change in how I dungeon master, too. When I was DM for a group my own age, from roughly 1980 to 2000, there was a certain level of performance anxiety. Every session had to be bigger and better, each adventure more ambitious and epic than the last. I couldn’t just create a fun, two-hour subterranean module… I had to bring an entire underworld civilization to life, with a believable backstory and vast cast of heroes and villains. Plus, it wasn’t enough to tell my players how many gold coins the undead dragon’s hoard contained. No, that was lazy storytelling. Instead, my itemized treasure lists ran to 7-8 pages (typed, of course), everything from paintings to furniture to bronze candlesticks, mixed in with bizarre, unique magic items that were frequently useless (or at least virtually impossible to figure out). 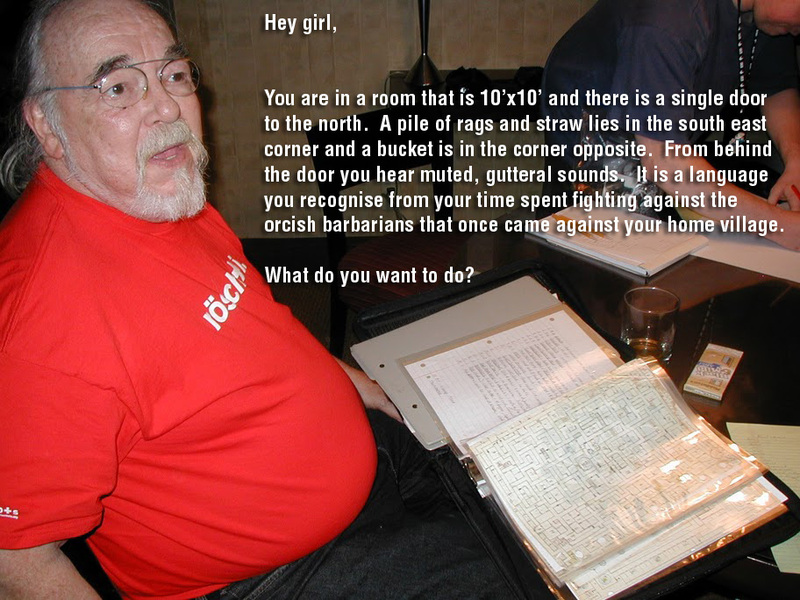 Gary Gygax. Just how much did this guy prep for game sessions, anyway? Click for bigger version. Photo by gqowlington. It got to be something of a joke: three sessions to get to the treasure, and one just to sort through it all and figure out what half of it was. In short, it was all about the world I was creating, rather than what the players wanted to do. Sure, the rewards for this kind of obsessive over-preparation were sometimes considerable. My memories of the incredible adventures we shared are some of the best of my life. And they were epic. It wasn’t unusual for a single grand quest to start in Athens, lead to the scattered islands of the Cyclades, into the underwater gladiatorial pits of the deadly sahuagin, to the Elemental Plane of Ice and the palace of the Frost Giant King, and end at last in a great cave at the foot of a volcano, to wrest the legendary Spear of Athena from a towering cyclops. And that was one of the shorter ones. 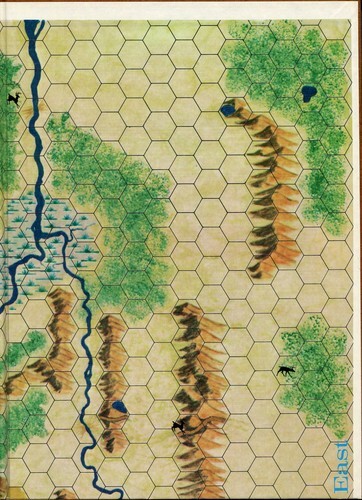 But the prep time required meant that game sessions were frequently separated by months… and even then I felt chronically underprepared, terrified my players would see through the thin veneer of the world, and realize how much I made up as we went along. Gaming with my kids has changed all that. I don’t prepare. At all. Everything — even the treasure lists — is made up on the spot. When my kids ask what that giant bugbear who foolishly tried to ambush them was carrying, I simply inform them he had a bone knife, a spool of fishing wire, 14 gold coins, a pouch of moldy cheese, and a half-carved figure of a wooden horse. They frequently stare at me, dumbfounded. “How can you remember all of that without looking at your notes?” they ask. All part of being a good DM, I tell them calmly. It isn’t about impressing my friends with my imagination and hard work any more. Now it’s all about making sure my children and their friend have fun. I can’t tell you how liberating this is. Simultaneously, it’s forcing me to be more attentive, as this style of play is more about listening than about prep work. Listening, for example, is how I knew exactly what encounters to throw at them as they pushed their way through the huge open air market in their home town. Tim, the magic-user, ran into an alchemist, selling pricey ingredients to mix a variety of powerful potions. Drew, the lumbering fighter, encountered a blacksmith showing exotic — and expensive — plate mail. Will the Ranger met up with a man trying to unload the kind of lumber needed to make a heavy catapult. And Taylor, the druid, bumped into an old man selling two squirming war dog pups, barely 8 weeks old but already huge, friendly, and unswervingly loyal. Of course, just as any good DM would do, I told all four they only had enough gold to purchase one item between them. What began as a five-minute diversion becomes a lively hour-long adventure in the market as my children haggle, debate, promise, and horse-trade to get what they want. And then excitedly brainstorm how they can lay hands on another 400 gold coins. For the next week, it’s all they talk about, as Will daydreams about building a catapult and Taylor tries to decide on names for her dogs. Oddly, I feel I’m getting in touch with Gary Gygax’s original vision of the game this way. As much imagination and creativity as the master exhibited, its clear to me the style of play he espoused had more to do with spinning an engaging story for the players, rather than adhering to the DM’s design. 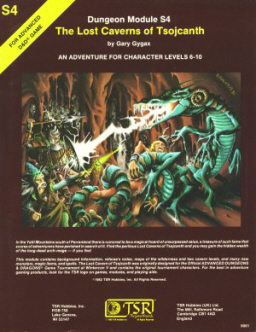 I started to look to Gygax for inspiration in other ways as our fledgling campaign unfolded. That turned out to be a great idea. 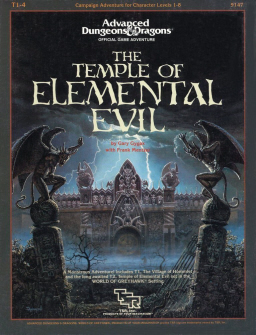 For example, when it came time for my players to undertake their first true wilderness adventure, I distantly remembered that for his original Greyhawk campaign — home of the Tomb of Horrors, Temple of Elemental Evil, Castle Greyhawk, The Lost Caverns of Tsojcanth, Against the Giants, and countless other famous adventures — Gygax had made heavy use of Avalon Hill’s 1972 board game Outdoor Survival. This is rather an odd thing: co-opting the components of a game from a competing company as a crucial part of your own rules. The only comparable example I can think of, in fact, is the first edition of Cheapass Games Kill Doctor Lucky, which didn’t bother including a game board — since the game is a re-enactment of the murder that’s solved during a game of Clue, players were rather obviously expected to use the Clue board. 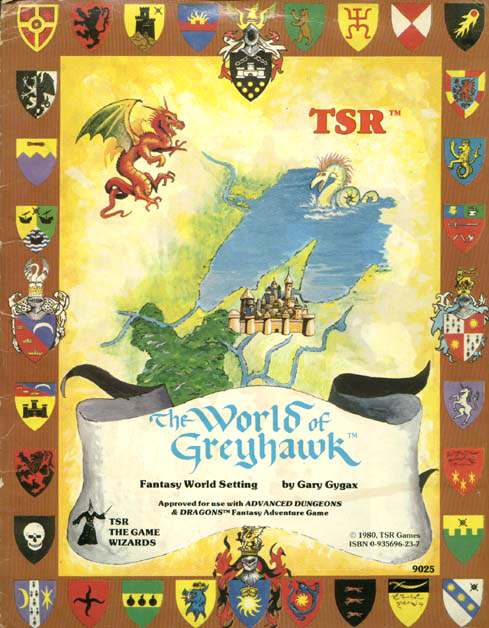 The fact that Greyhawk was set on the Outdoor Survival map was something of an open secret among early D&D players — and TSR didn’t bother to hide it, even going so far as to list the game on the “Recommended Equipment” list in Volume I of the original 1974 edition of Dungeons & Dragons by Gygax and Arneson (ahead of dice!). Outdoor Survival has a reputation as a fairly pedestrian game. At Board Game Geek, it has a dismal 4.48/10 rating. I’ve never met anyone who’s actually read the rules. Nevertheless, over time it became one of Avalon Hill’s perennial bestsellers. Its success is attributed chiefly to the fact that it was sold outside regular channels — in outdoor equipment shops and the like — and because a whole generation of D&D players apparently thought of it as an essential component of any great wilderness adventure. 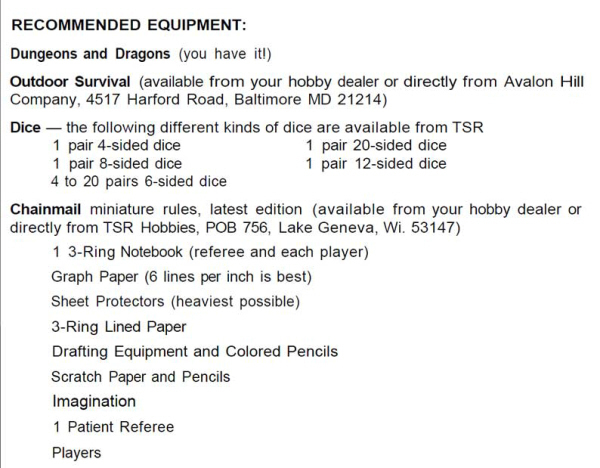 Regardless of Outdoor Survival‘s virtues as a standalone game, it makes a terrific D&D accessory. When my young players ventured beyond the borders of their cozy town and nearby woods, into the rough-and-tumble northern frontier, I knew I wanted to mark the occasion. I found a used copy in great condition on eBay for under $20, paid for expedited shipping, and it arrived Saturday morning. I didn’t have time to do more than tear open the box. I hid it under the table, and when my players finally left civilization behind, I placed the first of the three interlocking maps on the table before them. They stared at it for a few minutes, then looked at me. That’s precisely what they did, taking their first excited steps onto a storied map that has been home to countless D&D campaigns before. Every move they made was debated as they scanned the mountains, forests, swamps, and deserts of the map, looking for danger and adventure. This was an entirely different style of play from the dungeon delving they were used to. Being able to see the map brought much more deliberateness to their explorations, heightening the anticipation while giving them a sense that they were more in control. The anticipation came from unexpected danger, of course. Every new hex they entered meant a roll on the encounter table hidden behind my screen. In their first hours, they stumbled upon the colossal skeleton of a long-dead lizard, a hungry owlbear, a pair of mated hippogriffs, a snoozing tree ent, a verbeeg, and a cruel band of goblins driving a slave caravan through the narrow valley to the west. Before long, of course, they were off-course and nearly lost, their original goal in exploring the frontier nearly forgotten. I had to come up with something for them to really sink their teeth into — continuously rolling on encounter tables had its charms, but it was going to get old fast. And that’s when it occurred to me. 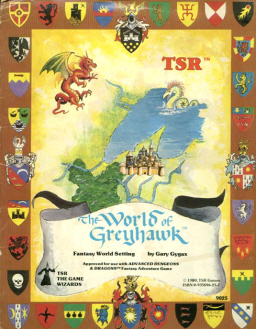 If we were indeed re-creating the original Greyhawk campaign, treading over the same hallowed ground as the first players lo those four decades ago, why stop with just the map? Why not place Gygax’s greatest adventures in their path as well? And so, when my young players made their way to the edge of the map above, plunging into the western marsh and eager to see what would be revealed when they stepped into the next section, I told them they’d spotted a worn track, leading to what looked like the ruins of an old moathouse. Nestled near the confluence of the two rivers at the center of the western marsh, I placed the moathouse from Gygax’s The Village of Hommlet (1979), the introductory module in his Temple of Elemental Evil mega-adventure. It took several game sessions for them to clear the moathouse of the minions of Lareth the Beautiful, the chaotic evil cleric servant of Lloth behind the Temple’s resurgence. The final battle, in the dungeons below the ruins, was touch-and-go, with deadly spells flying and desperate acts of heroism, but they came through okay — and most of them reached fourth level in the process. Will they follow the clues from here to the Temple itself? Or will they go back to exploring the Outdoor Survival map? Whatever we do, play out classic modules or carve out original adventures of our own, I’m very grateful to Gary Gygax for showing me the way. Again. I feel I’m rediscovering Dungeons and Dragons all over again with my kids, learning new ways to add fun to a game that already meant a tremendous amount to me. As for Outdoor Survival, I’m just surprised I never thought of using it before. I think it could have added a great deal to any number of campaigns I’ve played over the years. If you’re interested in trying it out in your own campaign, copies are cheap and plentiful, even though it’s been out of print for nearly two decades. Right at the moment there are 23 listings on eBay alone, ranging in price from $5.99 to $29.95 for used copies. 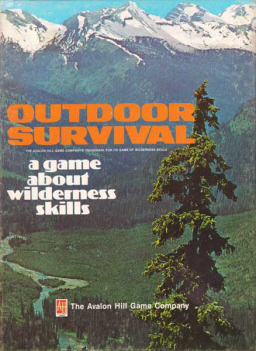 Outdoor Survival was designed by Jim Dunnigan, founder of SPI, and published by Avalon Hill in 1972. It comes with three full-color interlocking, folding maps; some cards; rules; and a bunch of other stuff I’ve never looked at. Outdoor Survival also makes an awesome alternate map for Avalon Hill’s Starship Troopers. You have to come up with your own rules for a couple of things, but it’s very easy. I played Outdoor Survival with my brother Back In The Day. The convict pursuit scenario was our favorite. > Outdoor Survival also makes an awesome alternate map for Avalon Hill’s Starship Troopers. !! Ingenuous. I’ll have to dig up my copy of STARSHIP TROOPERS and try out some of that action. How long before you play your first D&D game with your own brood? Oh, that’s probably years off. At least 8. BTW, if your crew ever gets tired of fantasy and wants to do something pulpy set in the 30s, just give me a holler. Didn’t you review a pulp-era RPG for an early print issue of BG? I can’t recall the title. I think it was a set of adventures for Savage Worlds, a “universal” system I happen to admire. Sadly I don’t get to GM much, but when I do I like to run Savage Worlds. I posted on FB with a little more info so as not to bore people here, John. What a great post, John. Really. This captures so perfectly the wonder I had for the game back in the early days. Fantastic. Thanks, Chris. I’m really pleased you enjoyed it. John, you might be the only person who has made me wish I’d actually had children. For gaming! I am pained by this post. Pained that your children will be out of the house before you can blink, but happy that you’ve found this time with them and that D&D can once again light a candle of family unity in an old DM that lost his way when life got too complicated. You would have stopped gaming when your oldest was 4, and probably tried to entice him when he was what, 7? 9? 12? How odd it must seem that in a world of video games, tablets, and smartphones [wow, can you believe I left TV off the list as a 4th choice!] that there is a movement to return to tabletop gaming, and that the shared experience is still so viable. Thank you for writing this John, and thank your kids for embracing it. I have no idea what the future holds for my son and gaming, but I hope that one day I can share a couple of blissful years with him and his friends before all is said and done and his life moves on to college and world in which I’m no longer an integral part. > John, you might be the only person who has made me wish I’d actually had children. For gaming! They’re also useful for mowing the lawn and shoveling the driveway in winter. 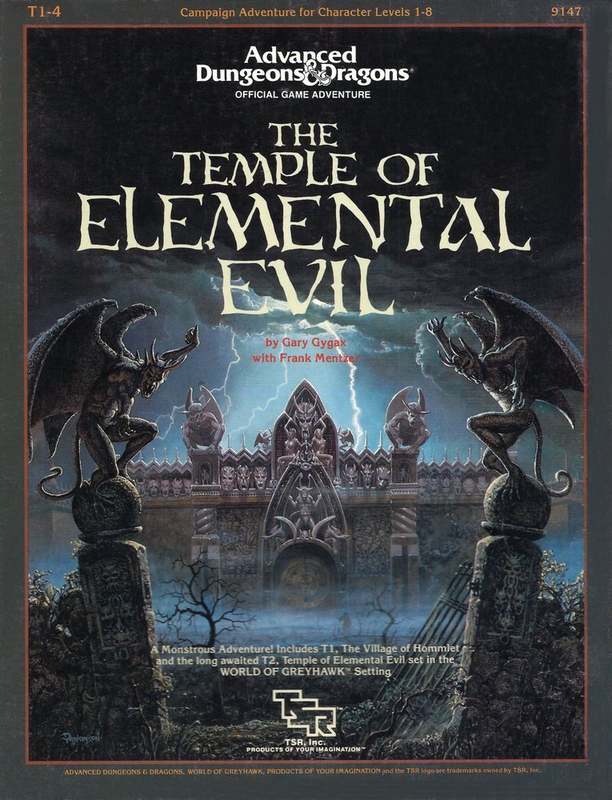 I’m thinking about EXPEDITION TO THE BARRIER PEAKS… but I wouldn’t wish TOMB OF HORRORS on my worst enemy. If I could just find a cheap shrink wrap machine, all my problems would be solved! I hope you get the chance. I think the secret to being a successful parent (one of them, anyway) is to make an effort to have things in common with your kids. It’s meant I’ve had to watch a lot of anime and play a lot of video games over the years, but I’ve made that effort. I’m just glad they met me halfway with D&D, and that we share a new adventure every Saturday. Sounds like good advice! I bet a Captain’s log would add a lot to that adventure. I just checked though, and EXPEDITION is ranked as suitable for characters level 8 – 12. Far out of range of my young charges, I’m afraid!